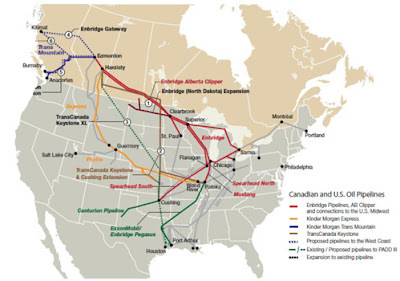 Keystone XL Pipeline construction on southern leg to begin by June. TransCanada Corp. has been given the go-ahead to begin construction on part of the Keystone XL pipeline that will run from Cushing, Oklahoma to highly industrial south east Texas. This $2.3 billion portion of the pipeline is considered to be in more urgent need. The White House gave their approval on Monday: "As the president made clear in January, we support the company's interest in proceeding with this project, which will help address the bottleneck of oil in Cushing that has resulted in large part from increased domestic oil production, currently at an eight year high ... Moving oil from the Midwest to the world-class, state-of-the-art refineries on the Gulf Coast will modernize our infrastructure, create jobs, and encourage American energy production." The Keystone XL pipeline project was broken into two construction phases so that TRC could get on with the work while waiting for the Obama Administration to approve a new more environmentally friendly route through Nebraska. The pipeline has had a few setbacks this year. First the State Department delayed a decision on approving TRC's permit for the Nebraska portion until early 2013 so that a new Nebraska route could be negotiated. In January, the administration denied TRC's permit, but by their own admission, the rejection had more to do with the arbitrary Republican-imposed deadline on a decision than the environmental concerns posed by the project. TRC announced it would be reapplying for the permit this week. It is speculated that approval for the northern portion of the line will commence after the election season dies. A new Nebraska route also has the backing of U.S. President Bill Clinton, husband of the Secretary of State, who says the pipeline should be embraced.